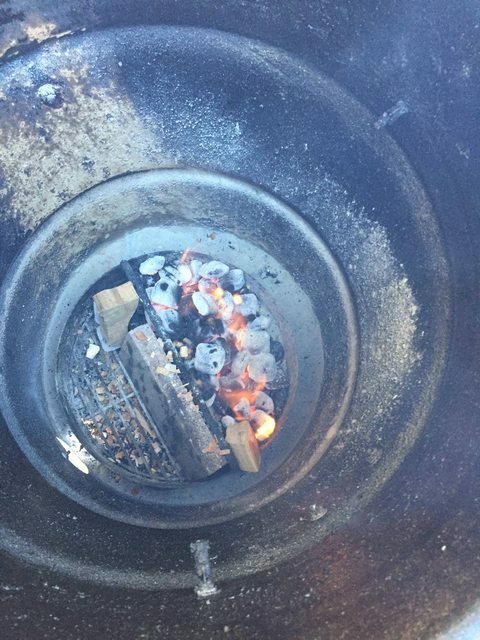 Pit Barrel Cooker (PBC) Appreciation Thread - Page 509 - The BBQ BRETHREN FORUMS. I rarely post pron. I’ll do it this time. The chicken is Rosemary Ranch Chicken. Pretty common recipe, but my family doesn't like chicken breast prepared any other way. Usually just use gasser or kettle, but competition in an hour or two: me and PBC vs. the Mrs. and her gasser. Oh yeah. A throw down of another kind. Be careful...once you beat her...this will be your job from now on!! 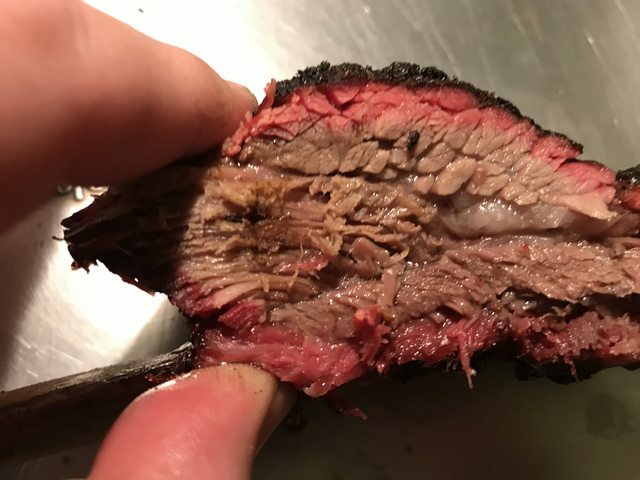 Got 4 plates of beef short ribs, and was wondering how do you guys like doing them? 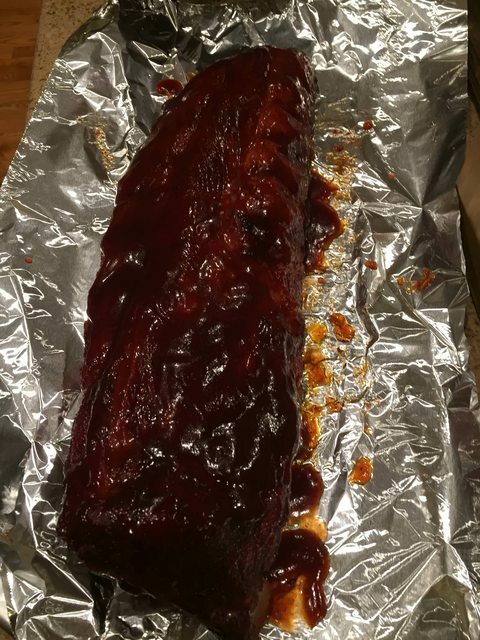 I tried smoking a couple of slabs in the pbc, but I was rushed for time, put them in foil and they were slightly tough, but the worst was the pot roasty taste. Oh a throwdown! Let's get ready to RRRUUUUUMMMMMBBLLLEEE!!! Breast quicks up even quicker Kanco. It'll be done faster. 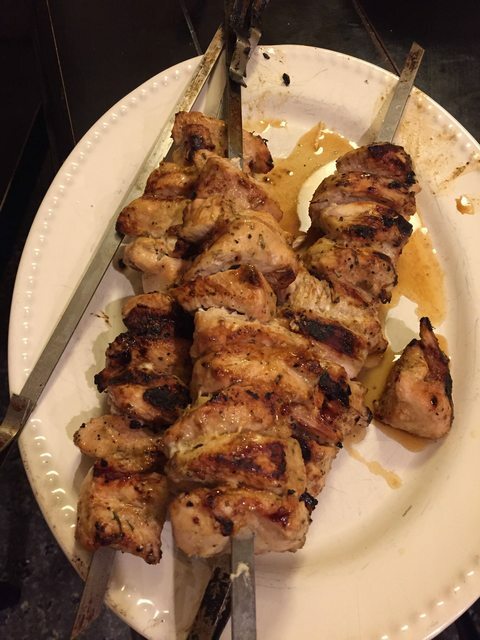 I always use thighs for kabobs so you threw me a curveball. 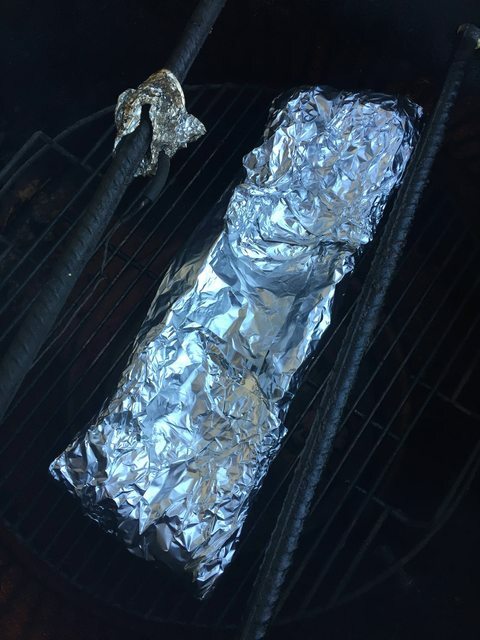 "Rushed" so they sat in the foil too long and turned into pot roast. Right, I was thinking cooking all the way unwrapped and just waiting for it to be probe tender. Maybe if it's getting too much color to wrap in BP. Honestly BP or foil doesn't matter. I've had the same results with both and probably bette with foil than BP. Once by peach BP runs out I'm going back to foil. 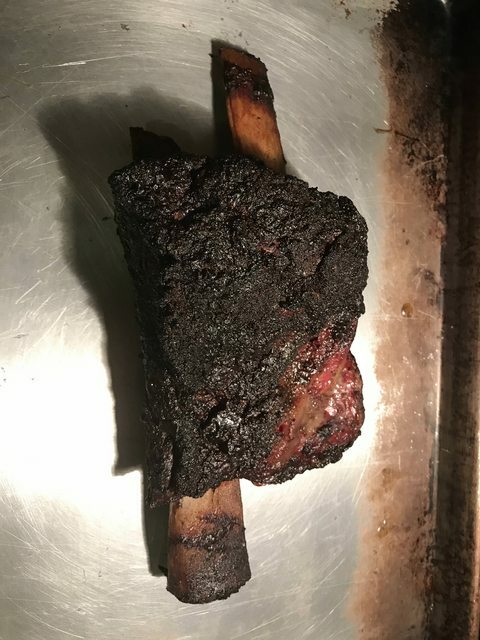 In my opinion you can't get too dark or have too much bark on short ribs. Even if they look burnt like a meteor on the outside they are tender and juicy on the inside. I never wrap. OK, so the throwdown vs. the wife didn't go quite how I expected. I won (according to everyone), but.......I had to finish on the gasser. 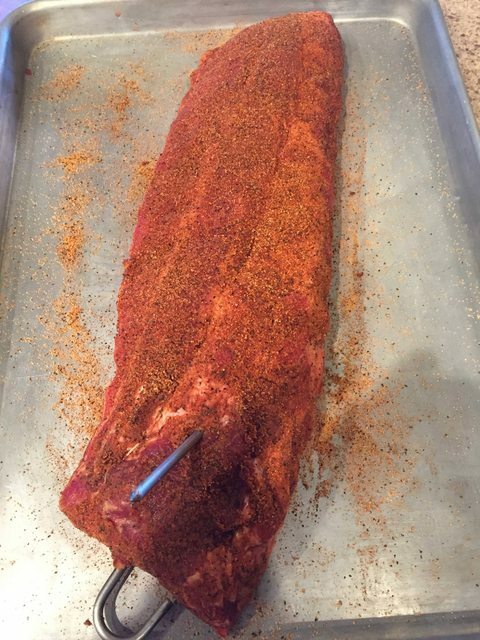 See, I smoked a rack of baby backs (just one--trying a new recipe) on the PBC that afternoon. Thought I had plenty of fuel to finish that and then put chicken on afterwards. Turns out I could have used a little more charcoal at the start of the cook. By the time it was go-time for the chicken the PBC wasn't able to give the heat I needed, and I had a hard time-crunch. Ran out of time. Ran out of fuel. Dadgum. So the chicken kabobs were hanging in the PBC for 20 minutes to get the flavor, but couldn't get the temp past 270ish and the IT wasn't past 120* in that 20 minutes, and I needed to hurry this thing up. So I took them off the PBC and finished them on her gasser for a few minutes. The good news is you could definitely taste the flavor difference. Unanimous, including the Mrs.
marinated and skewered. I wish I could space them out. I think they weren't cooking fast since they all bunched up together. Smaller pieces next time. Here they are off the cooker. The darker ones are hers--better sear, of course. But flavor off the PBC dominated. This recipe is killer. 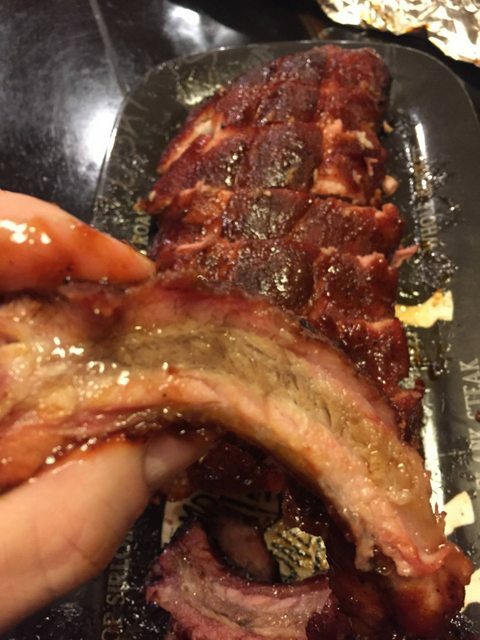 Moist, tender, flavorful. I don't know how to do anything better with chicken breast. 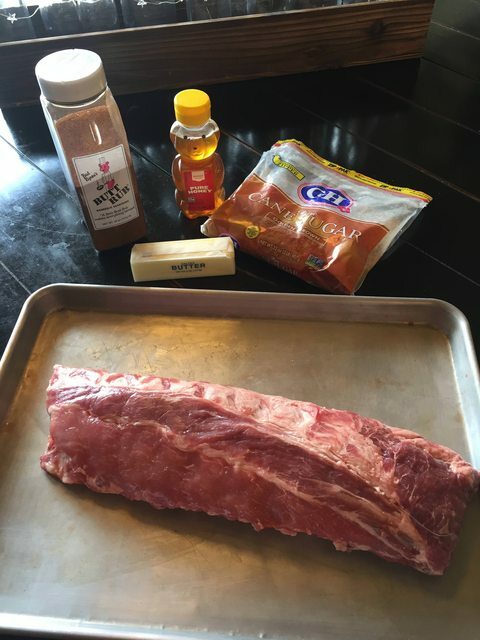 And now...Ribs! I used to like SSRs, but I think I'm swinging back to BBRs. Please don't take my Q-card for saying that. Plus, the family prefers them, so I'm cooking for my audience. This isn't a unique recipe. I've just never done it. 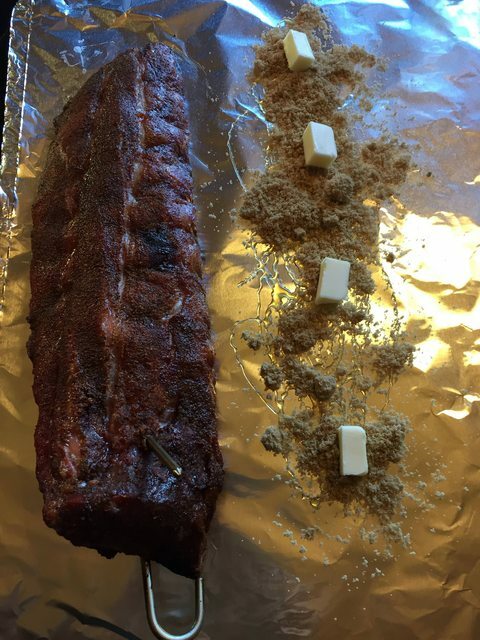 It's the one where you cook nekid for a few hours, then wrap with brown sugar, honey, butter, and BBQ sauce. 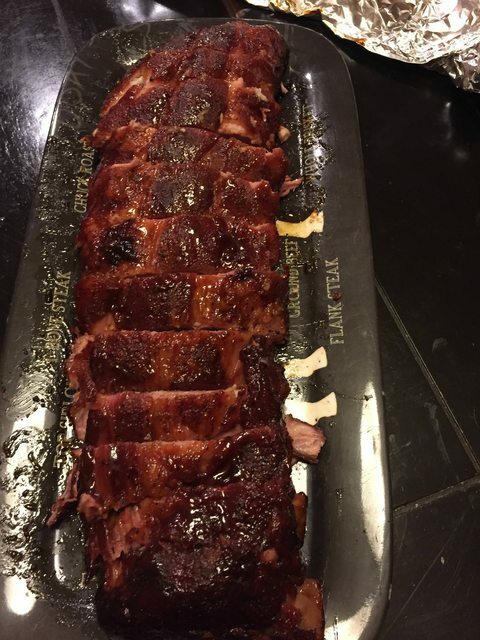 I know baby backs are only supposed to take about 3 hours on the PBC but mine never seem done that soon. It's always 4+, and no, they're not falling apart at that point. Just not done. 1. Membrane removed, didn't bother with a binder, rubbed with Bad Byron, let sit for about 2 hours in the fridge. Rack was 3.2 pounds. 3. Hung naked for 3 hours. Temp settled in just below 300*. 6. unwrapped. 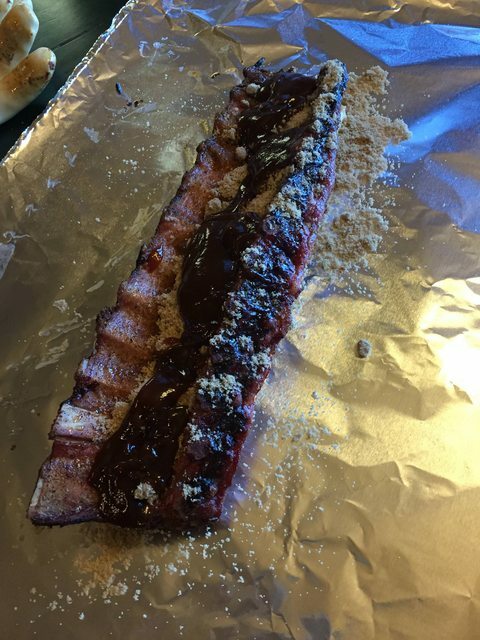 Made a glaze of equal parts BBQ sauce and drippings from foil; painted both sides. 7. Put it back in the PBC for about 15-20 minutes. 8. Took 'em off and wrapped again for about 25 minutes. 9. Open, sliced, family demolished them in no time flat. Really excellent. Gonna do that again. OK I'll go with no wrap the whole way. Makes it that much easier. Just joined and subscribed today. Acoording to fed ex my pbc jr will be at my house today. Now I have been asked to cook beef tenderloin for the family christmas next weekend. 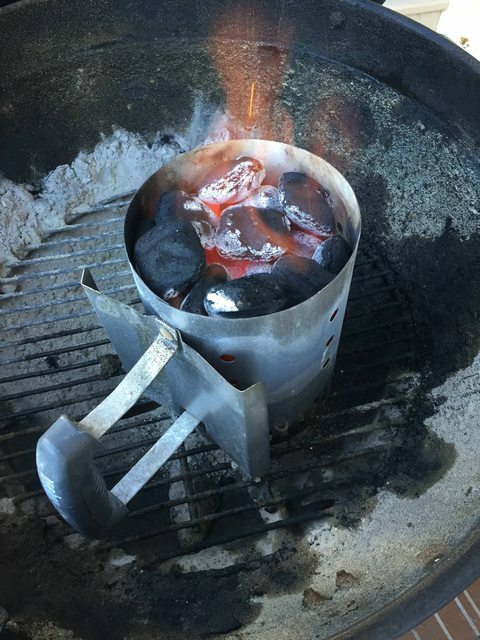 I have been using my weber performer for all of my cooking untill now. I will do a trial run this weekend with the pbc and would like to use it next weekend. Any tips on beef tenderloin would really be appreciated. Hang or grate? I am struggling with approximate cooking time since I have not had a chance to use it. I really do not want to blow christmas dinner. Any advice would be greatly appreciated. Find More Posts by I cook it and eat it. Welocme Gary! I'm excited to see what you can do with the Jr. For tenderloin I'm assuming you want to serve medium rare so it won't take that long. 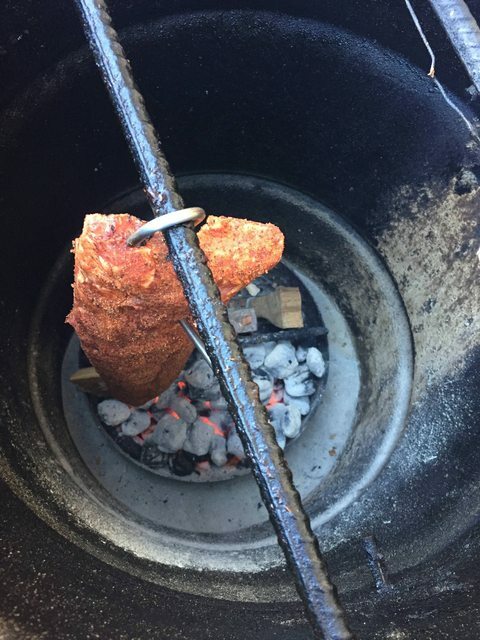 The traditional recommendation would be to smoke in the PBC until about 110, then pull off and sear on the HOT Performer for a a few minutes on each side until you hit an internal temp about 130....then pull it a rest it for a 10-15 minutes before you slice. I would say it won't take more than an hour on the PBC, but it depends on how thick the meat is and how hot the Cooker gets. You can probably hang or grate, although it depends on how long the tenderloin is. You may have to cut it in half either way.